My TRAVEL and ART Series continues…. If you have been reading my blog, you would be knowing that I am just back from God’s own country and it was my first visit to two of its pristine places, Alleppey and Thekkady. Despite having been to Kochi thrice before, this was the first time that I came back super impressed with Kerala. As they say, until you indulge in a place, you never happen to like it well. Thus, as an ode to my splendid houseboat experience, I wrote this- Taking a spicy route in the backwaters of Alappuzha and for my adventures of Thekkady, here I begin reminiscing. I had an action packed itinerary in Thekkady and of course I am just not complaining. Of all the thrilling activities, the night walk in Periyar, the visit to cardamom plantations and the off-roading trip to the grotto will always be memorable. 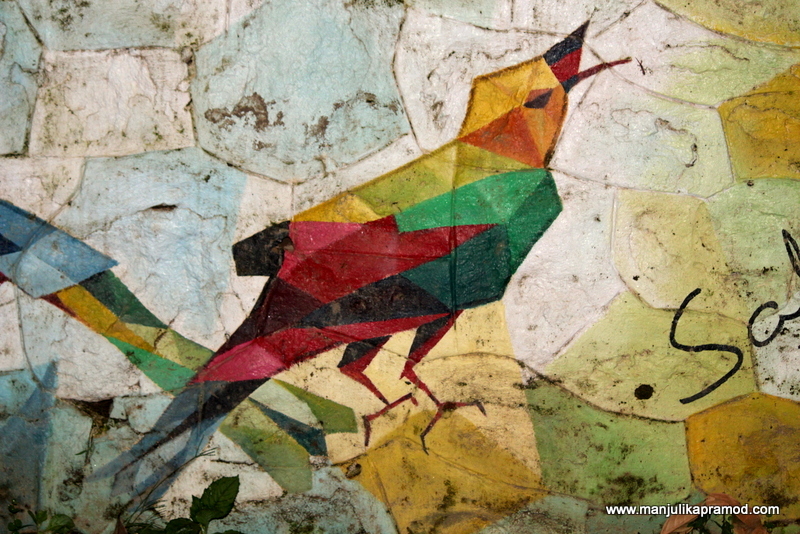 Apart from that, I was also impressed with the talent of its local artists as I discovered some jungle wall art and was elated to bring back these colorful memories. 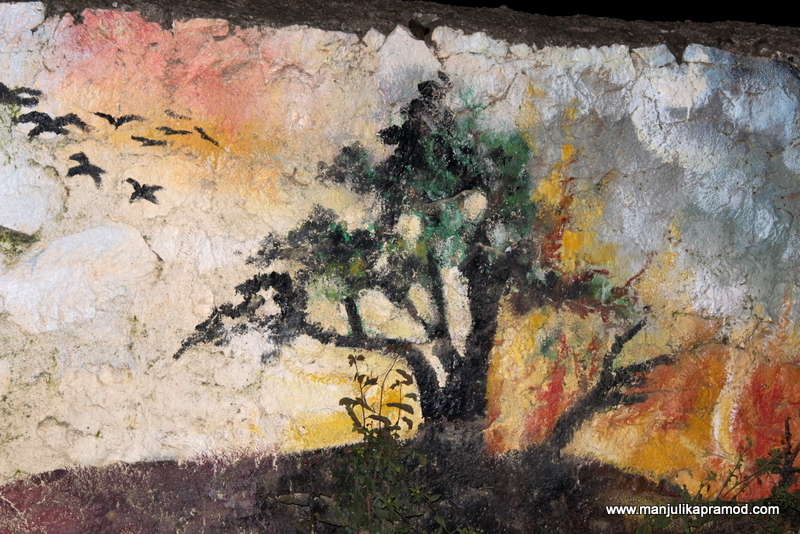 I found one colorful painting peeping through the mush of trees and then a long stretch of wall just outside the gate of the jungles where our Periyar night scouting trip was about to begin. Though I wanted to explore it all, I couldn’t because the walk was supposed to begin at that hour and it was already time. I decided to come back to it after this activity in hand. I had done night safari in the buffer zone of Kanha National Park but never a walk in a real jungle. This was my first night trail in the buffer area of the jungles and I was absolutely upbeat about my first nocturnal adventure. 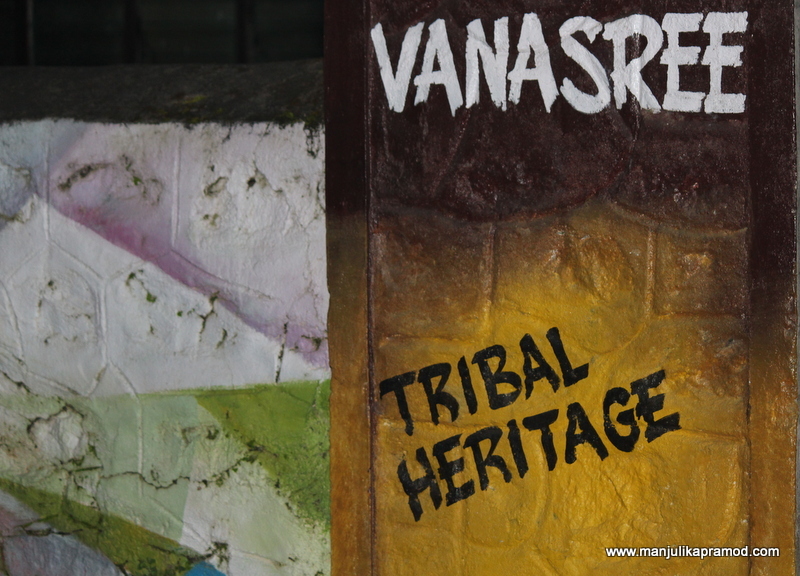 Well, all that happened in the jungle deserves another post as it turned out to be crazy fun, but after my return I did not forget to walk down through each and every mural. 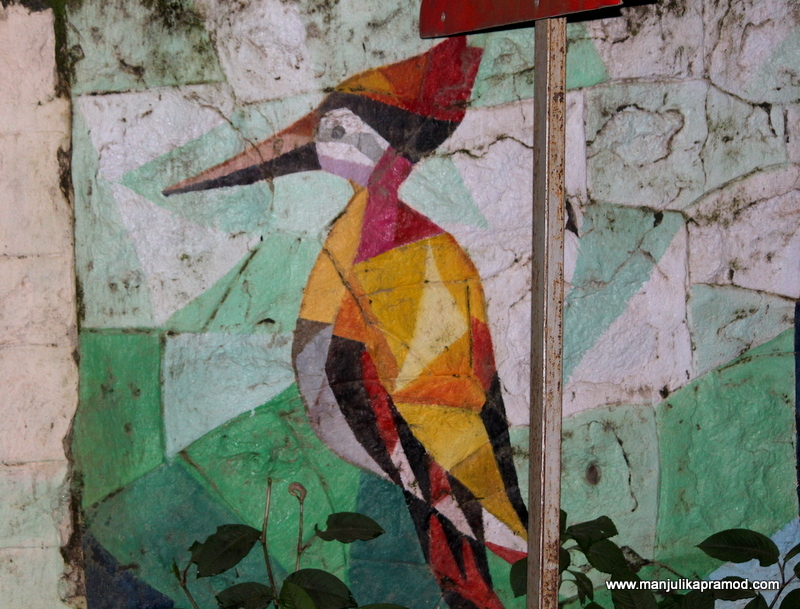 Streets adorned with wall art always delight me. The interesting part was that though we did not get lucky with any tiger or elephant spotting in the jungle, some lovely paintings of big animals and birds revived the jungle feel all over again. The tiger, wild boar, elephants and the birds looked for real. Though some of them had faded, yet the use of bright colors showed that they had been done with great precision. 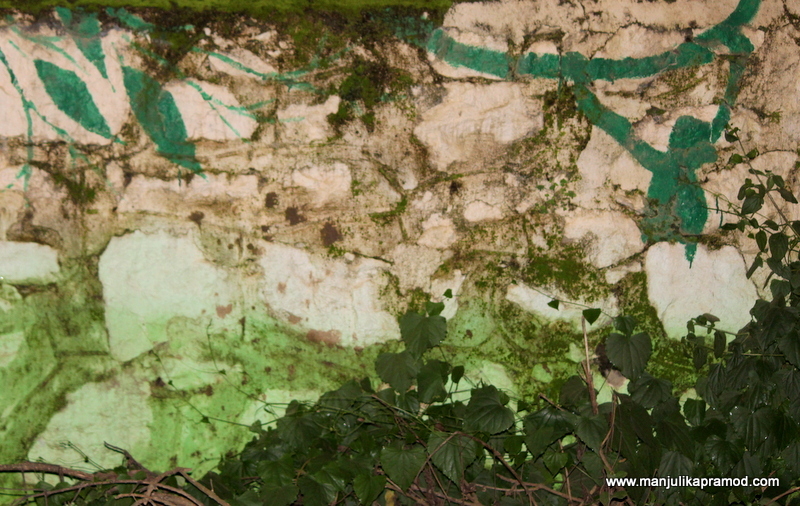 The layer of wild plants beneath the paintings gave it a nice 3-D effect too. Despite having a leech bite, I walked till the end of the street to photograph them all. I am not sure if many people know of this. 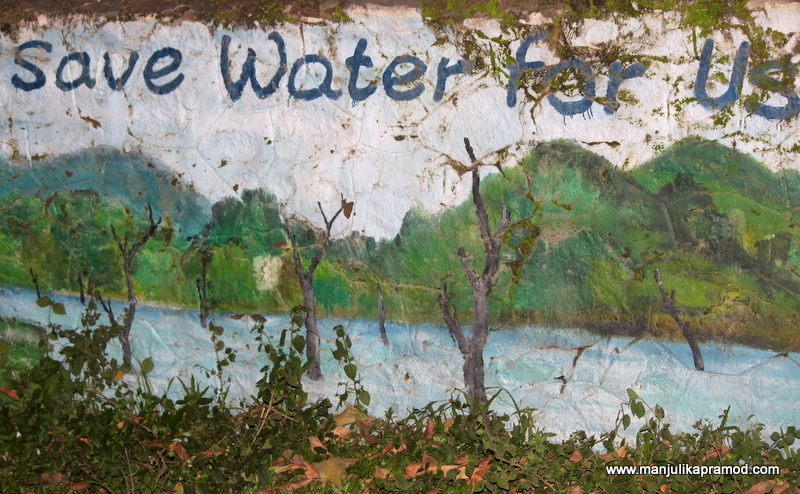 This wall is located just opposite the gate of Bamboo Groove, where participants and visitors are expected to assemble for the night trail. The placement of these paintings is very apt. 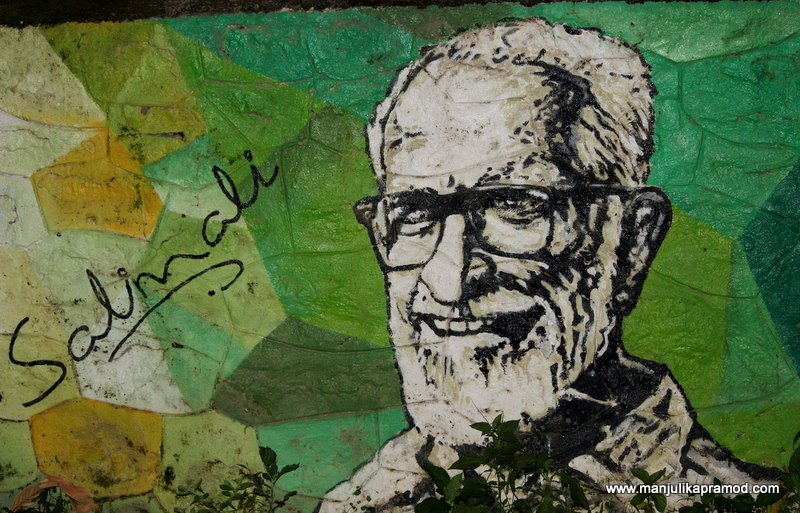 The best mural was that of Dr. Salim Ali, the birdman of India. Periyar is in Thekkady in Kochi in India. I have always had an eye for modern art, street murals, graffiti but ever since I managed to do a solo trip to Penang in Malaysia, the fascination has turned into a beautiful passion. A little splash of colors is enough to make me stop and take a picture. My eyes peel through every wall and search for that one interesting and colorful street of every village, town or city that I travel to. I love to capture emotions and expressions painted in colors. I look for it everywhere. I wish to travel to every place on Earth where humans have exuded their emotions through art. Amen! OUR JUNGLE TRAIL STARTED AT BAMBOO GROOVE IN PERIYAR FOREST. I AM GLAD TO HAVE STIMBLED UPON THIS WHOLE STRETCH OF WALL ART WHICH STANDS JUST OPPOSITE THE GATE. 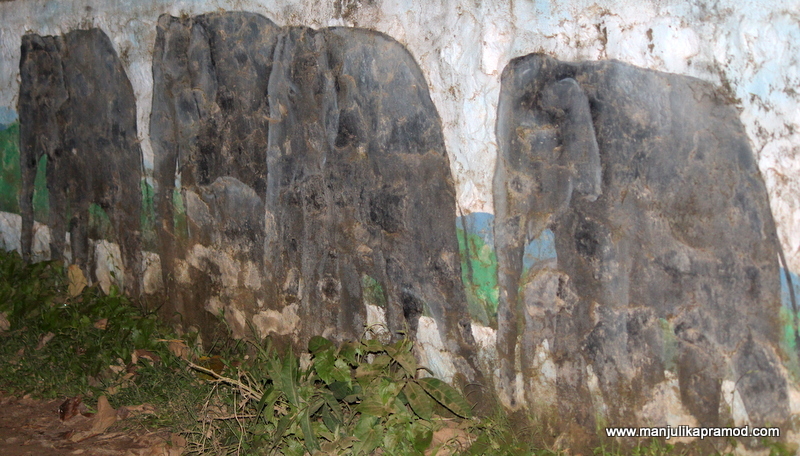 The famous elephants of Periyar adorned the walls. Don’t forget to check out these blogs! These are some really interesting and colourful works of art! I particularly like the one of the dancing girls, and the political message in the save water, save trees, so poignant and true! A great read. 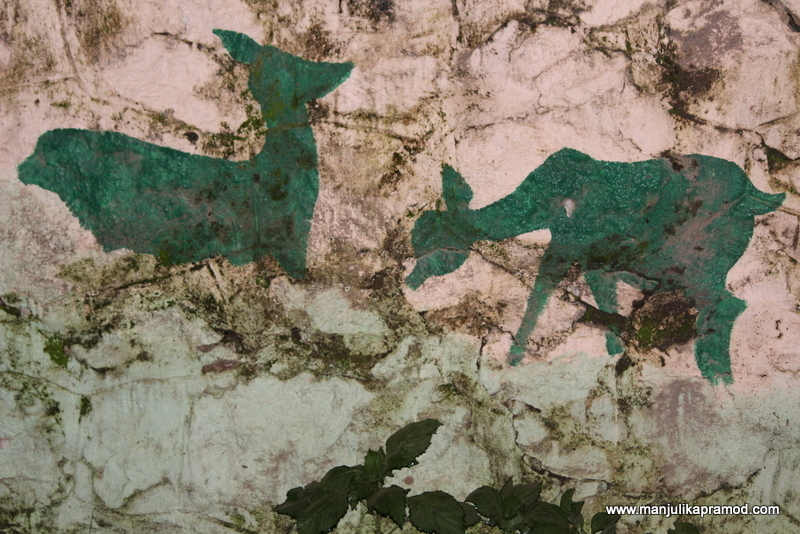 These wall art in Periyar is beautiful and educational too. 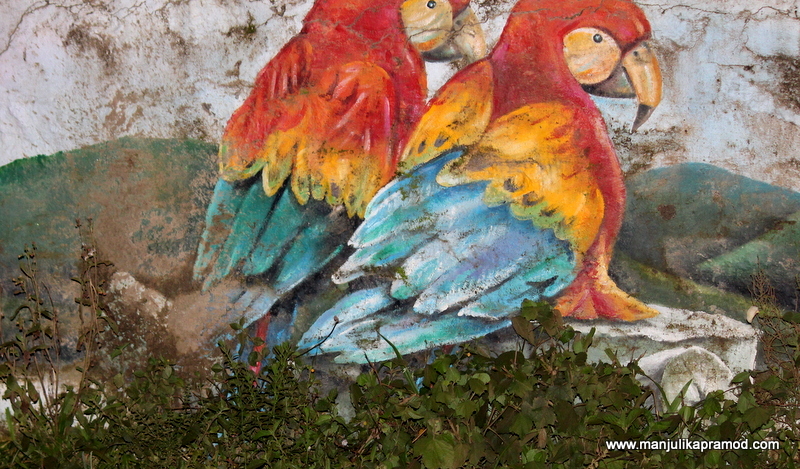 Art always fascinates me and I always love to capture and enjoy street art of any place. 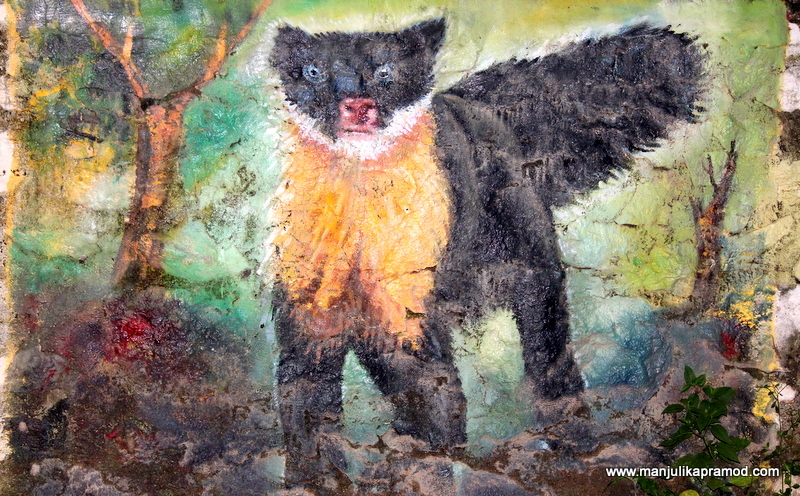 These art forms behind bushes sometimes look like a real animal is hidden behind. Also on some of them there are educational messages like Save water and all. I was not knowing about the Birdman of India. Thanks for sharing! Wow! I love these! These are quite beautiful! My favorite mural is the elephants. Thanks so much for sharing this art! You’ve found some real gems in this part of India. The art quality is so good and the colors are really vibrant. I think the pieces capture the local vibe perfectly! Brilliant and so happy that they are celebrating Salim Ali as well. The Art is magnificent and I love how the subtle and very natural colours sort of merge with the surroundings standing out just for people to spot the art. Truly lovely and thanks for taking the time to capture them all. Wow! You do have an eye for detail. 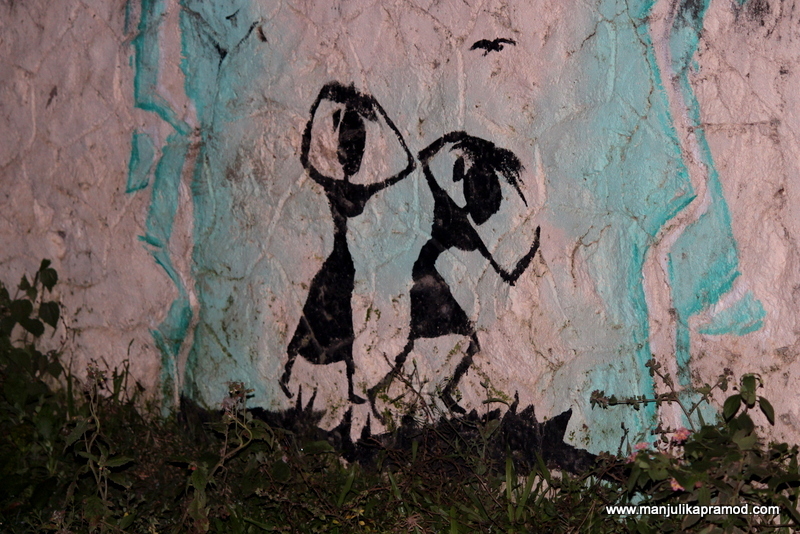 When you’re thinking of a night safari, paying attention to the wall would be the last thing in mind, but you did manage to observe and document it! Awesome Manjulika!! Reading your post too, I’m elatd. This is perfect artistry and considering my love for street art, they are beautiful. And it’s colourful too. I can imagine how you felt walking pass these pieces.